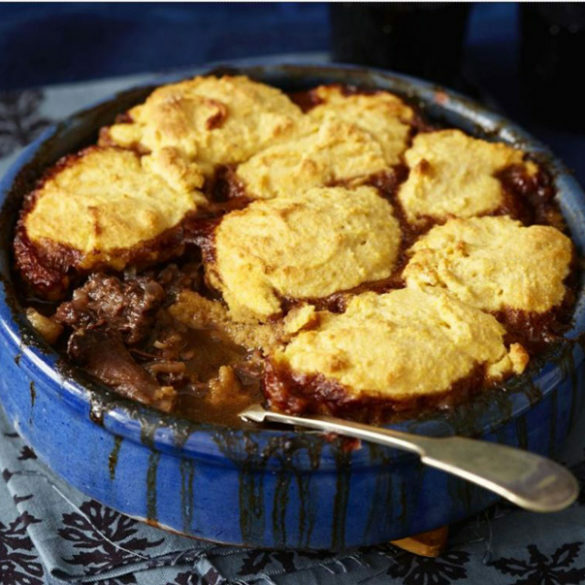 Dumplings or amadombolo were usually reserved for big traditional family gatherings on my grandfather’s farm, but occasionally Mom would surprise us with a hearty stew served with dumplings. 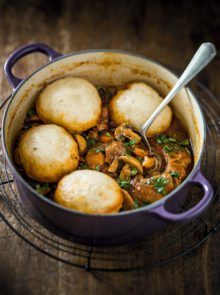 And this easy dumpling recipe will ensure it becomes a weekly treat during winter. And for dessert? 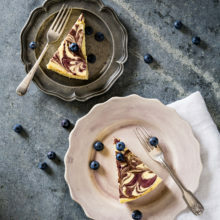 Try this Bluberry-Ripple Baked Cheesecake. Season the flour with salt and pepper and use to coat the beef. 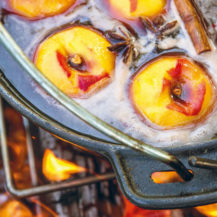 Heat the oil in a large saucepan with a tight-fitting lid over high heat and brown the beef in batches. Set aside all the meat. To the same saucepan, add the onions, carrot, bay leaf, thyme and mushrooms. Sauté until the vegetables begin to soften and brown. Add the tomato paste, tomatoes and stock and bring to a simmer. 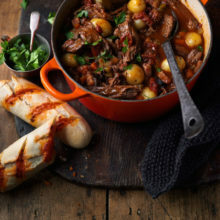 Return the beef to the pan, cover with the lid and gently simmer for 1 hour or until the meat is tender. In the meantime, make the dumplings by mixing the flour, salt, sugar and yeast in a bowl and adding enough warm water to form a soft and pliable dough. Knead the dough until elastic, cover the bowl with cling film and leave to rise for 30 minutes in a warm place. Pinch off small bits of dough, roll into balls and place onto the stew, which by now has been cooking for about 45 minutes. Replace the lid and simmer for a further 15 minutes or until the dumplings have cooked through.